Image source: Screenshot (Steem Monsters). Screenshot was taken on 2019.04.15, 13:28 CEST. 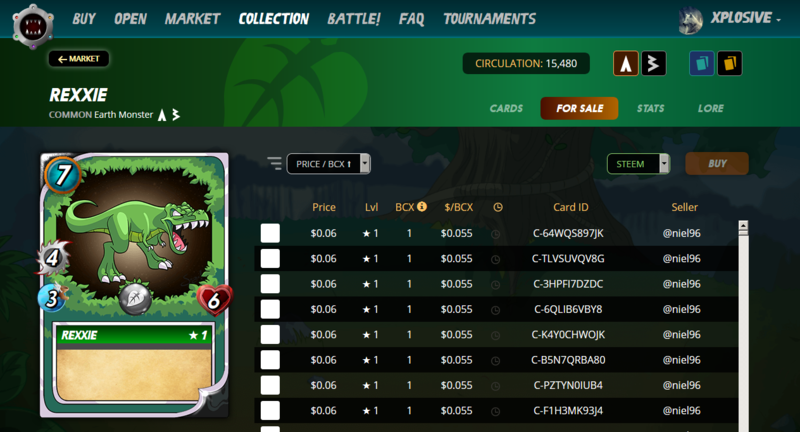 As you can see in the screenshot above, currently there are 15 480 cards in circulation of this card, and the current cheapest price of this card on the Steem Monsters Market is $0.06 USD. I bought it for 0.127 Steem. What does this card do during a battle? This card is cost 7 mana during a battle. This card have 4 melee attack and 3 speed points by default. This card have 6 health points by default. The default attack, speed and health points of a card can be increased by using certain summoners and monsters. Important! You can also use Alpha cards with Beta summoners, so you don't need to have Alpha summoners to use this card. The delegation (lease) time is the same (two weeks) (14 days). You can choose from 1 card. If this delegation contest will be successful (supported) (upvoted) (earn more than 0.127 Steem), then I will buy more Alpha cards, and feature them in card delegation contests and giveaways. Upvote and resteem is not required to participate in the contest, but greatly helps the contest. There will be one randomly chosen winner. I will use a random name picker (https://www.miniwebtool.com/random-name-picker) to choose the winner. I will choose the winner after 1 week counted from the posting of this poll. Thank you for participating in the contest! Good luck! I would like to win a level 1 Alpha "Rexxie" (COMMON Earth Monster) card delegation (lease). I am not interested in the delegation (lease) of this card. I am not interested in the delegation (lease) of this card, and I am not interested in Steem Monsters either.